One of the most common questions I am asked 'how much does a cake cost?' This is a difficult question to answer as every cake is unique. Prices are determined not just by reference to the size of cake, number of tiers and ingredients, but also to the complexity of the cake and the style you want. In my 30 plus years experience as a cake designer and maker, I can honestly say, no two 'Sheffield Wedding Cakes' cakes have been the same, they are all personal and unique to the client. Please contact me for prices for any specific cake designs of your choice. Discounts negotiable for multi cake orders. 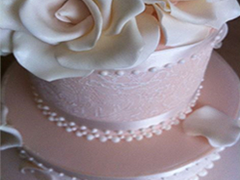 Delivery: Within Sheffield area £10.00 single tier cakes, £15.00 multi-tiered cakes. Outside Sheffield but within 20 mile radius £1.00 per mile single tier, £1.50 per mile multi-tier. Outside 20 mile radius subject to agreement. Cheap imitations and mass produced cakes are available from your local supermarket and untrained and unqualified 'Sunday bakers'. If you really want to make your occasion extra special and impress family and friends, I am confident that I will always offer the best value for money and that you will not find equivalent professional quality and attention to detail cheaper!